Everybody loves a bit of crumbed bird. I discovered this combo when I was trying to think of a way to make chicken an enticing finger food for D Man, so although this particular version is served as large schnitzels for big piggies, if you make it in fingers it gets devoured by little piggies too. I don’t serve it to D Man with slaw though, that’s a tad adventurous for a budding cutlery user, but he does so love this with mashed vegetables with some peas and corn stirred through for excitement (if not exciting at the table, then in the following day’s nappy). 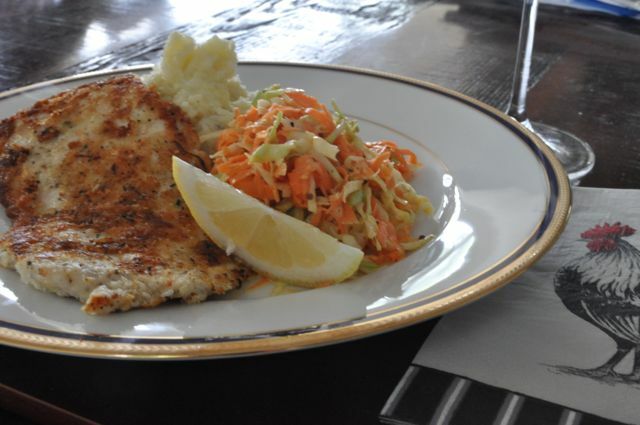 This schnitzel recipe is fast and easy, mostly because I am very lazy and do so love to cut a culinary corner. I do not sacrifice flavour, no, no, but if I can speed things up a little, I will, because I’m busy, and I’m tired, just like you. My secret? I don’t flour and egg, I skip that entire step. If you want to go the whole shebangalang, then please, be my guest, but I find I’m perfectly content with a crumb that is a light coat, as opposed to a heavy jacket! If you’re all inspired and fancy whipping yourself up some sourdough crumb, go forth. I personally always have Japanese panko crumbs on hand as they’re a cracking substitute when you don’t have the time, or inclination to make your own. They can be found in the Asian department of your supermarket or at an Asian grocery store. I don’t rate your standard store bought bread crumb, but if that’s all you have, let’s make life easy and use those just this once. This is about ease……..although I draw the line at using cornflakes. Just eat plain chicken in that case, and save the flakes for Honey Joys, mmmkay? I serve this with mash, but I very rarely, if ever use a straight potato mash with any of my meals. I usually team it with cauliflower, but I’ve been known to use parsnip when in season. This is for two reasons. Firstly, I don’t like too many complex carbs in my diet (left over habits from the Atkins era) and secondly, this way I can sneak an extra serving of veg into a meal. When I asked Mister H recently if he could really taste the difference between my mash and real mash, he responded “It’s been so long since I’ve had full mash that I don’t know what’s real anymore”. Poor deprived man. Lemon wedges to serve, zestless is fine. 2 finely julienned carrots – I use a vegetable peeler to make fine strips, then cut them again finely on the diagonal. Easy. Take your chicken and place it between two pieces of Cling Wrap on a board. If you have a meat tenderiser, use that, but if not, you can use the bottom of a palm sized jar. Now, beat that little chicken! You don’t want to pulverise it, but you want them to be nice, thin and even schnitzels. Once done, throw together your crumbs, cheese, chopped thyme, zest and seasoning and combine well. Coat your schnitzels well by flipping them around and patting it on. Set aside. I steam my potato and cauliflower in a vain attempt to preserve nutrients, so I cut my potato small and my cauli not so small so they cook at the same time. Pop them on the stove to steam and make your slaw. Combine carrot and cabbage on a bowl and in a separate bowl mix wet ingredients. 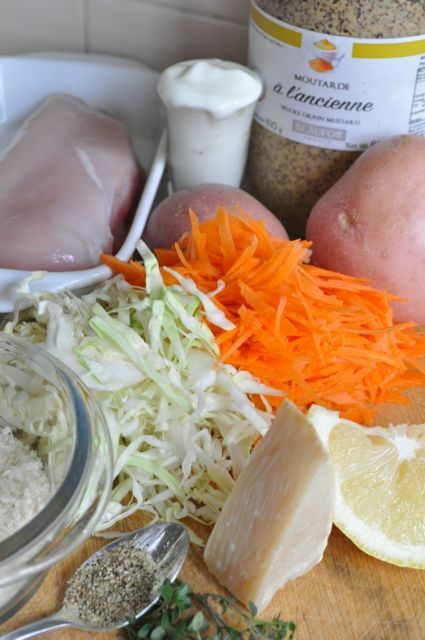 This recipe keeps your slaw low fat. I like it to be slightly tangy from the yoghurt, and not over dressed and gloopy and dripping. If you’re more of a mayo type, then add a little more, if you hate mustard, leave it out. Let’s be relaxed about it. Anyhoo, mix to taste and pop it into the bowl and combine. Heat a little oil in a non-stick pan (I know certain oils corrupt at high heat etc, but this is not that blog. I use olive. Very corruptible, like my fair self), and cook your chicken on both sides until golden. Pop it all on your plate, pour a big glass of wine and serve with a lemon wedge. Being not so flash in the kitchen, I just want to say ‘thank you’ for this simple simple easy peasy chicken dish! I just made it for lunch while my girl was having her nap! and even had time to whip up the muesli bars too! Both are so yummy, especially the chicken, so moist, fresh and zingy! Keep the recipes coming!! You have converted a previous crumbed meat hater. Rosco, as a crumber meat lover, is v happy. Made it the other day and it was delicious! Have now outsourced my menu planning to your blog.